I like to think of myself as low maintenance but in a high expectation kind of way. Taking my makeup off every night is important as I’ve got temperamental skin and I’m not keen on making things worse. Similarly to pharmaceuticals, not all substances on your face are water-soluble and need to be handled with care. After a long day, with makeup, sunscreen (we try), oil and pollution (yea this is a thing) usually cleansing once isn’t enough. Have you ever cleaned a pair of leather heels? You’ve got to get the dirt and dust off before you can properly polish the leather, same goes for your skin. Before you can properly deep clean your skin you’ve got to remove all the crap from the outside, seems simple enough. So then why don’t we do it? Because it’s hard right? It’s too much of a hassle? Today’s makeup is created to last: primers, long wear 12hr waterproof formulas but all these formulas can trap in oil and dirt- I repeat oil and dirt (lovely little particles that make you break out!). What happens when you mix oil and water… they separate. Water can’t effectively remove impurities from oil because they don’t mix. I find the easiest way to clean efficiently, but gently, without killing my skin and removing so much that I’m left dry is to use oil and micellar water. Depending on how my skin is feeling/if I wore a lot of makeup or if I did a lot of activity I normally start with an oil cleanser, I find it’s “gentle on skin but tough on everything else”. It takes off makeup (waterproof or not) and leaves skin feeling baby soft. Afterward, I follow with a cotton puff damp with micellar water, and I run it over my whole face neck and behind my ears to clean off any leftover I didn’t get with the first cleanser. I only do this routine in the evening, as in the morning my face isn’t covered in makeup or the day’s dirt. In the morning I start off with Glossier’s Milky Jelly Cleanser, it’s light, moisturizing and has a faint smell of lychee (to me at least). 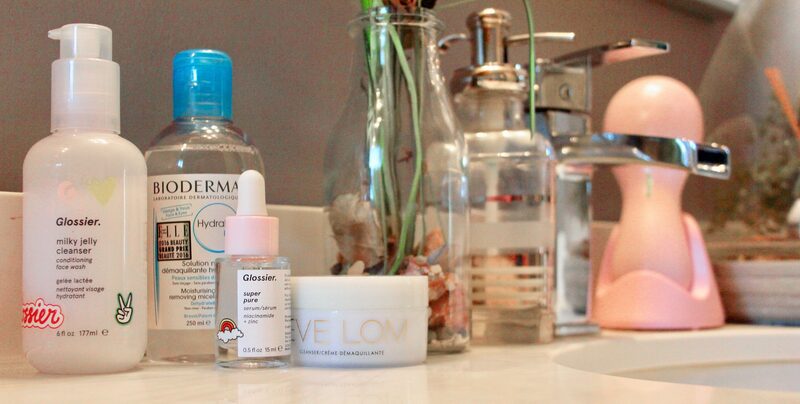 Sometimes I use a toner (cause it feels so damn good) and I always follow with Glossier’s Super Pure Serum (calms breakouts and redness) and some moisturizer and TA-DA! Renewed skin that is clean, plump and ready to better soak up all the active ingredients of your products. Do You REALLY Know About Micro-Needling ? Next Post Vlogs: What do you want ?